Katherine, Kate Pierce-Keller’s grandmother, suddenly moves into a house near Kate and her mother in Bethesda, Maryland, because of her incurable cancer, but there is another motive behind her move. When Katherine gives Kate a peculiar medallion with an emanating blue glow, a key that Katherine claims, will let her jump to the past, Kate begins to think that Katherine is out of her mind. After Kate reads Katherine’s futuristic diary consisting of entries from her CHRONOS missions of recording events in history, and experiences “hallucinations” after touching the CHRONOS key, time travel becomes a frightening reality. Soon after, Saul, Kate’s biological grandfather and Katherine’s ex-boyfriend, causes a major shift in Kate’s timeline as he alters time to create a religion to help him gain power and money. She meets Trey, a boy who attends Briar Hill and helps her as she realizes that her mother does not exist, her father does not recognize her, and her best friend is a Cyrist in this timeline. To help shift the timeline back to Kate’s reality, she learns how to harness her time-traveling ability with the help of Katherine, Connor, and Trey. In order to defeat Saul and the Cyrists, Kate will have to jump back in time and warn Katherine. Consequently, Trey will have no memory of Kate, but she has to succeed her mission to try to defeat Saul and Cyrists and save the world, as she knows it, from collapsing. 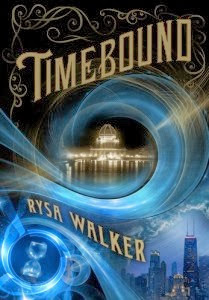 My first impression after reading through a few chapters in the book was that the author had included confusing, but creative concepts of time traveling. As I started to delve further into the book, I understood these concepts through the detailed experiences of the characters. While the book is filled with science fiction and adventure, it is also emotional and relatable because of the hardships Kate faces through losing people she loves while she struggles to save her timeline. The book has a great mix of both simple and slightly challenging vocabulary words that are easily understood through context clues. The one weakness this book includes is the slow beginning which did not hold my attention from the start, but started to build up its pace as it neared the middle of the story. I would recommend this book to ages twelve and over because of the book’s captivating plot, but hard to grasp concepts for younger readers. Overall, I would rate this book nine out of ten stars. 1. What color does Kate see the medallion as opposed to Katherine? 2. Why did Katherine buy a house near Katherine and her mom, Deborah? 3. What important item was in Kate’s stolen bag, and who told her to warn Katherine about the theft? 4. Who helped Kate after the temporal shift and where did he drive her? 5. What did Saul create when he went back in time and why? 6. Who ordered Aaron to cut off the call to security and get in his or her places for the time jump, and why did everyone listen? 7. What did Kate discover about Charlayne in this alternate timeline? 8. After Trey and Kate decide to visit the Cyrist temple for research, what does Kate discover inside the Cyrist bookstore? 9. What was Kate’s dress, which she was going to wear to her trip to the past, compared to? 10. How did Katherine disappear, but Kate still stay when Simon took away their CHRONOS keys? 11. How did “Mick” meet Kate and what did he offer her? 12. Why did Katherine believe Kate when she told her that she needed to make a certain trip? 13. Who helped Kate escape from the confusing building in which Dr. Holmes had captured her? 14. Where did Kate get the “little blue pills” from, and what were they for? 15. What does the disk that Katherine gave Kate show?